According to the Annals of the Four Masters, land-based settlement in the Ballaghaderreen area began in the townland that is immediately to its west and is now called Lung, as one of 16 forest clearings in Ireland during the reign of King Irial, which most sources agree occurred in the 12th century BC. The Lung river then became a natural border of the Luighne kingdom which was named after one of the 3 founding Milesian princes of our Celtic nation, only 2 generations before. This territory was ruled by their descendents the O’Haras and O’Garas until the 17th century, and its boundaries were adopted for the modern Diocese of Achonry. The Luighne people claimed ancestry from the Celtic Warrior Deity called Lugh whose name is connected with the August festival of Lughnasa, and the long ridge of high ground that cradles Ballaghaderreen as well as framing the Lung River Valley was called Slieve Lugha. The next historical reference for the locale is in a poem recorded in the Metrical Dindshenchas which was written down in the 7th century AD as part of the initiative of Columba, who was both bard and saint, in order to retain the Celtic heritage of our placenames. The poem recounts how in the 6th century BC, the Celtic High King called Aed Ruad, gave the land of Lung to a warrior leader called Techet (sometimes Dechet) who drowned at a festival there. The poem affirms that as a result of this incident, the lake was given his name, and the area now known as Lung was called Magh Na Luinghe or Plain of the Festival (literally Plain of the Cauldrons). This was a time when Irish Celts were very influential across most of Europe, so for such a level of patronage, there had to have been a thriving and regionally significant Celtic settlement here which would have had military, artisan, trading, farming and religious functions. Indeed, artefacts such as weapons, cauldrons, and drinking cups from the Bronze Age have been recovered from the river and are with the National Museum. It is said that the weapons were thrown ritualistically into the river, but it is equally likely that because the river was a frontier, they fell there in combat situations. From the Book of Lismore we learn that in the 6th century AD Columba visited the area in his reflective period between the war in which he played a leading role in the destruction of Tara, and his subsequent penitential exile. He surely employed Bardic irony to use the townland’s name for the penitential outpost of the Iona monastic system, because Magh Luinghe on Tiree island, was part of the significant change that he brought at the time to the Christian practice of penance which had fallen into disrepute. As part of the 12th century Norman invasion, the Costelloes established their main settlement and stronghold in nearby Castlemore, and maintained strategic forts along the Lung river. The most Irish of the Galloglass clans is the Sweeneys and they emerged at this time and later came Scottish clans descended from Somerled such as the MacDonnells and Sheehys who also settled into the Irish system as respectable loyal warriors. Having bolstered the O’Donnells in Donegal, some of the clan came to this locale to fight for their allies the O’Connors, and figures of 8 of them can be seen adorning the High King Felim’s tomb in Roscommon Abbey, as they do the graves of other kings and chieftains around the country such as in Glinsk. In 1259, they retook the O’Gara castle by the lake; and when they captured Castlemore in 1527, they also destroyed all other local Costelloe strongholds, which included a castle by the river Lung in Banada which was referred to as Meannoda in the Annals. 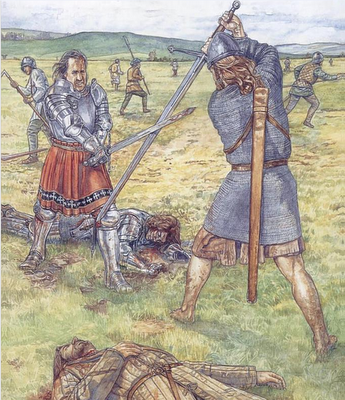 The Irish Galloglass is singularly accredited with confining Crown influence in Ireland to the Pale and some ports for over 300 years, and contrary to clerical bias, were reported by their contemporaries – English commanders, Gaelic poets, Irish chieftains alike – as being the equivalent of English knights, unrivalled in courage and skill as warriors, and loyal to their warrior oath unto death. As a warrior elite, they each had 2 helpers called Kerns and their 2-handed weapons required considerable skill and courage. The Annals of Loch Ce makes it clear that Sweeney Galloglasses fought for MacDermott throughout the 16th century and in fact the earliest reference to Ballaghaderreen is a 1548 reference to a killing there followed by a successful raid by the Chieftain and the local Sweeneys on Clan Muiris (near Claremorris) for 1000 cattle and 10 horses. The Galloglasses remained a potent military force until the end of the 17th century. 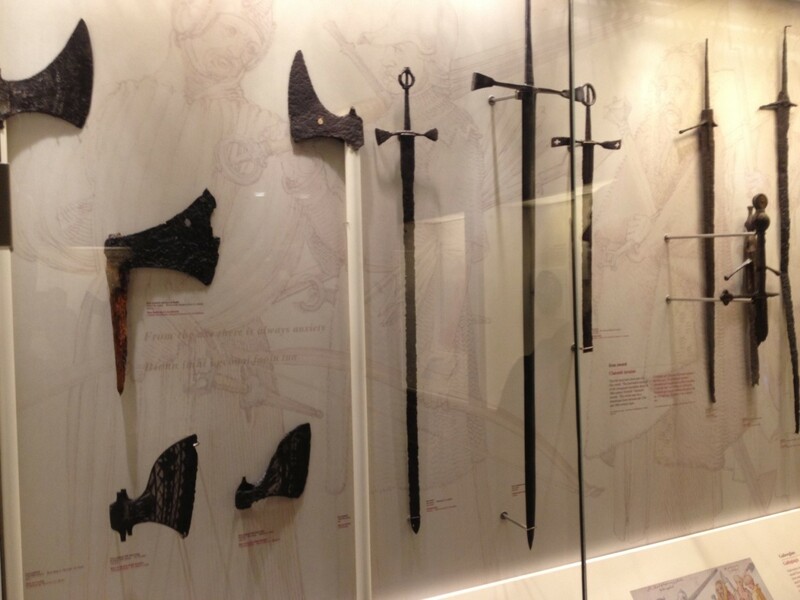 Weapons from this period were also taken from the Lung river, and they too are currently with the National Museum which has a section dedicated to the Galloglass showing their Longswords with their signature open-hearted pommel, as well as their battleaxes which were mostly used in formation manoeuvres. Later, through the 18th and early 19th centuries, on the crest of the field to the north-east of the eastern of the two Banada bridges over the river, stood Lung House, home of the local landlord and magistrate John Dillon which looked across the river to one of a number of local Sweeney Galloglass holdings. 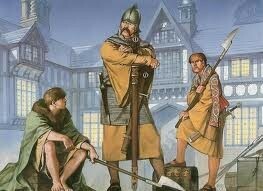 These Dillons were often distinguished from their namesakes in Loughlynn and were regarded as decent Irish folk. They harboured James Joseph McDonnell, a close relative of Mrs Dillon and a leader of the 1798 rebellion for 10 days while he recovered from wounds received at the Battle of Ballinamuck. Described as a “hospitable mansion” by McDonnell’s nephew, it was destroyed between 1829 and 1831 which was a time of considerable local land agitation, as was the post-famine period. Through the numerous famines of that century, the river was probably an important source of scarce protein, but while fishing on the Lung in those times was for many locals a matter of survival, today it is appreciated by many from far and wide as a rewarding sporting pursuit carried out in a harmony with nature that our Celtic ancestors relished. Many sources attest to the fact that the north-west remained more Gaelic than other parts and for longer because of both an initial royal declaration of the local land as King’s Cantreds, but also the strength thereafter of the O’Donnell military alliance which included O’Rourke and MacDermott and reliant on Galloglasses. The Lung-River system which runs from there to the Curlew Hills was never militarily breached: for instance, large English armies marching north were defeated there both before and after Kinsale, and the epic O’Sulllivan-Beara march from the southwest extremities of the country, only found refuge on arriving here even though Loughlynn was firmly under very harsh English rule of Viscount Dillon. It is reasonable to say therefore, that the Lung-River system was a frontier of Free Gaelic Ireland. As a result, much local culture remained uncontaminated and this is evidenced in the role that the local heritage such as music and folklore retained a Celtic artistic signature of natural vitality, intricacy, “abhorrence of a straight line” and mysticism that led important national cultural revival throughout the 20th century, through such personages as Douglas Hyde, William Butler Yeats, Michael Coleman and more latterly, Michael Flatley whose effect was to bring to Irish dance those Celtic qualities as uniquely preserved in what is known as the local South-Sligo Musical Style in which he plays the flute For instance, in virtuoso solo performances of masters such as Matt Molly and Seamus Tansey, the beginning of the tune is often disguised in bewildering flourishes, the line is broken which stores energy, any confinement of the spirit of the music through regularity of beat notes is annihilated, ornamentation is flamboyant – often bordering on manic – and the end is often a throwaway phrase that singularly asserts the great contradiction of human imperfection and artistic mastery. This Celtic pattern of flourishing such personal mastery rather than obedience to imposed confinement characterises our folklore, literature, and warrior heritage and is graphically represented in the freedom of our Gaelic games as opposed to the relatively neurotic confines of games that hinder self-expression and the free flow of the game with rules such as offside and irregular balls and implements. This existentially free spirit in our culture is something uniquely attractive to the outsider and it is represented in numerous personal-regenerative initiatives with multi-faceted potential to build on the considerable global platform of awareness established by the heroes of our cultural revival and its ongoing vitality. With high ground in the west of our province dedicated to spiritual revival since the inauguration of Lughnasa in the pyramidal shape of The Reek, and our own Slieve Lugha in the east, we should not dismiss the ancient view of the West of Ireland as a place of spiritual renewal in the Celtic sacred landscape, in which the area north from Slieve Lugha to Knocknarea near Sligo, and also south to Rathcroghan, is particularly rich. People are increasingly coming to appreciate that western civilisation took a fork in the road of cultural development along a Roman linear imperialist and exploitative approach to progress, in both socio-economic and religious pursuits, and that this approach denies so much of the human spirit that is maintained in the more holistic Celtic tradition. Therefore, it is only to be expected that the north-west of Ireland has a natural appeal as a destination for people from all over the world seeking a place to take time out for Self-Regeneration, and that we should fight to preserve our landscape as uncontaminated as possible. It is fair to say in conclusion therefore, that since earliest times, those who fought to protect the local people and their way of life behind our natural river frontier, as well as those who preserved our local culture, and those who emerged with that local heritage to revitalise our national culture at different critical junctures of our national history, as well as those who maintain its vigour for everyone to enjoy are all worthy of our gratitude – as is perhaps, the river Lung itself!